3d printing company EOS says that it has expanded its production capacity. 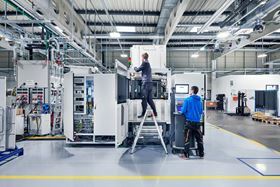 3d printing company EOS says that it has expanded its production capacity and relocated its system manufacturing facilities to Maisach-Gerlinden, just west of Munich, and closer to its headquarters in Krailling. The new facility, which measures 9,000 m2, will make it possible to manufacture up to 1,000 systems per year, EOS says. When a customer buys a system from EOS, factory acceptance tests (FATs) are carried out and according to EOS, at the new plant in Maisach, they will also have the chance to get involved in the acceptance tests of new systems. This story is reprinted from material from EOS, with editorial changes made by Materials Today. The views expressed in this article do not necessarily represent those of Elsevier. German 3D printing pioneer EOS has opened a new US facility in Pflugerville, Texas. Auto manufacturer DS Automobiles has used titanium additive manufacturing (AM) to develop new parts for its DS 3 Dark Side limited edition car.